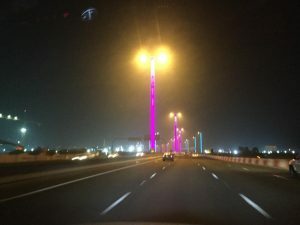 The streetlights on the way in from the airport are mounted on poles like light sabers: But who cares about that when there are proper showers available. Doha is not a real place, it’s the amazing facade you get when you throw huge amounts of petro-dollars around. Along the bay, around dhow harbour, the buildings are futuristic and beautiful. Between them are swards of perfect green grass and there is not a speck of rubbish to be seen. There are workers polishing things that would be lucky to get hosed down back home. Even the birds are picturesque and perfect. One of the jewels is the Museum of Islamic Art which is housed in a perfect angular building reminiscent of the classic Islamic star pattern. The building contains countless treasures from manuscripts dating back over a thousand years, to incredibly jeweled daggers, to pottery so old it defies belief that it survived. Predictably, our favourite pieces were the ancient scientific instruments. 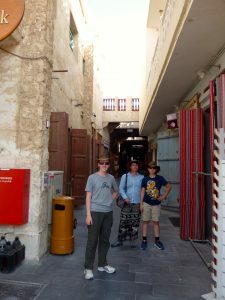 We strolled along the Corniche shaking our heads at the touts selling rides on the dhows and then turned sharp left into the Souk Waqif. Like so much else it’s a Disney souk: While it still functions as a market, it is perfect and clean and un-crowded. That said it was a lovely place to stop for lunch. Walking back through the backstreets showed another less shiny side to Doha. Building sites with guest workers on ledges without safety gear, dust and dirt, noise and rubbish. It wasn’t any more real though, just less finished. The backlots are all a work in progress with yet more shiny facades being put in place at an incredible rate. I can’t say that our stay in Doha has plumbed all that the city has to offer. But it does feel like it takes only a few hours to get a sense of Doha, or at least the incredible shiny facade. Regardless, we’re all feeling pretty happy thanks to proper showers, a relaxed day not bouncing about in a truck, and a swim – and now only one more leg back to Sydney. Green, green grass in Doha. Doha and Museum of Islamic Art.